How’s that? 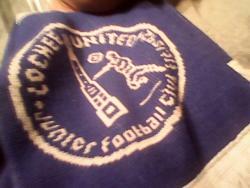 What do you know about lochee united? Plus who are Darvel!! Very very hard draw away to beith. Should be a cracker of a game though. Beith will be favourites imo but lochee are very capable of beating anyone. Look forward to my first trip to beith juniors. As I’ve said previously I’d take anyone at home. Who does everyone else want?? Cheers. Said on the Scottish thread I’d take anyone at home. Thoughts?? Good luck to Douglas. Hope you win it.